Currently the life cycle isn’t fully implemented. Only the on_init and on_start will be called, but please prepare your app to support the following life cycle methods. The on_init() is called the moment after the apps have been ordered at the dependency trees. This means, there is not yet a stable point to communicate to apps, so it should only initiate local actions, such as clearing variables, initing related services (like startup of http server). The on_init() method is a coroutine and will be waited on before starting the other apps init action. The on_start() is called at the moment all apps, models and other components are ready and the apps should be started. In the method you should init the receivers inside of your app, make an active operation that would init remote connections. For example, you would really like to start showing UI for all players, or initiate local variables based on other apps or the player manager. The on_start() method is a coroutine and will be waited on. 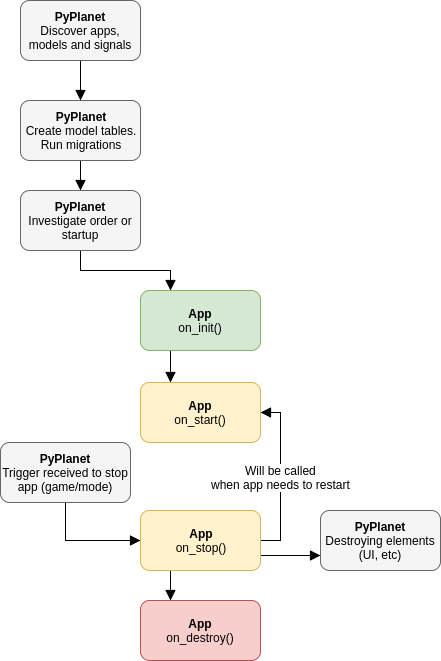 The on_stop() is called when stopping the app internally (so not when exitting PyPlanet!). Some situations like game mode switching will make sure that no apps are being active at the moment of playing an incapable game-mode, game or another app is unloaded that was depending on your app. PyPlanet will make sure your UI elements are hide from your players, so you don’t have to do this. But remember that the app could start at any time, meaning that some context would not be valid anymore, and you should take care of this in the on_start() again. The on_stop() method is a coroutine and will be waited on. This method is only called when the app is going to be removed from memory, just before. Mostly only used to save some data. The on_destroy() method is a coroutine and will be waited on.